The Russian Progress 43 cargo craft launched from the Baikonur Cosmodrome in Kazakhstan at 10:38 a.m. EDT on Tuesday (June 21). An unmanned Russian cargo ship launched into space Tuesday (June 21), carrying a fresh load of supplies and equipment for astronauts on the International Space Station. 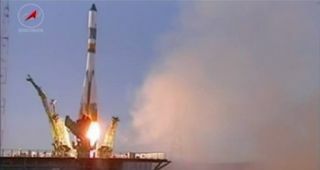 The Progress 43 cargo ship blasted off at 10:38 a.m. EDT (1438 GMT) from the Baikonour Cosmodrome in Kazakhstan in Central Asia. The robot resupply vehicle will dock at the space station's Russian Zvezda service module on Thursday (June 23). "There's a little less than 3 tons of supplies, equipment, fuel and oxygen," NASA spokesman Kelly Humphries told SPACE.com. "There's about 47 kilograms (104 pounds) of NASA, [European Space Agency] and [Canadian Space Agency] science supplies and equipment." The Russian Progress launched a day after another unmanned cargo ship departed from the International Space Station to be intentionally burned up during re-entry into Earth's atmosphere. After spending about four months attached to the Zvezda service module, the ATV-2 was filled with trash and unneeded cargo, and undocked from the station at 10:46 a.m. EDT (1446 GMT) on Monday (June 20). The spacecraft's departure made way for the arrival of the Progress later this week. The ATV-2 is expected to burn up over the Pacific Ocean later today. The space station is currently home to six residents – commander Andrey Borisenko and flight engineers Alexander Samokutyaev and Sergei Volkov of Russia, Ron Garan and Mike Fossum of NASA, and Japanese astronaut Satoshi Furukawa. The six spaceflyers make up the station's Expedition 28 mission.